TCurrell had the most liked content! Plants and general biology, the sciences, computers, reading, music and beer! BE3610 N. maxima x N. burbridgae or just N. Maxima? I can see the Burb in it to be honest. 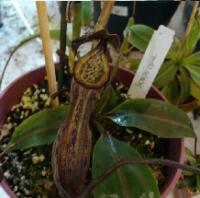 Leaf shape and tubbier pitchers seem to show burb influence. It never occurred to me until this thread that bongso uppers could be so nice! Looks similar to a "Sanguinea" i purchased that turned out to be a Rebecca Soper. A few more, White form ventricosa pitchering for the first time in forever. Rajah looking more rajah like now. Neoguineensis still going strong. Baby peltata. Murudensis? (from Krzysio) Mirabilis var. globosa and the bane of my growspace yet another x Miranda flower I'm going to have to stop growing Mirandas as they just grow far too quickly. Just a quick update. Seems to be growing steadily. not the fastest but certainly not as slow as some of my ultra highlanders. Aww man, you've done it now. I definitely need to get a spectabilis after seeing yours. Is it a quick grower for you? Its a numbers game, many germinate but very few reach maturity. Many will be unable to compete with other vegetation and be choked out while some will get lucky and germinate in favorable conditions. We think the mortality rate for seedlings in cultivation is high but its nothing compared to in the wild. ooh please do, i'd love to see more of this species! Amazing, where did you get undulatifolia? i would love to own this species but it is like proverbial rocking horse poop.